Receiving a printed copy of the Annual is a perk for Members. issues posted here on our website. 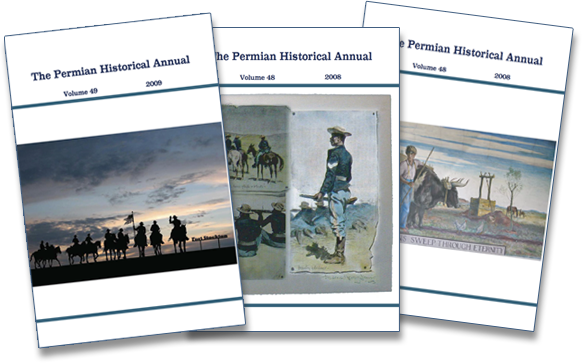 The Permian Historical Annual welcomes submittals of scholarly articles, reminiscences, edited interviews, and other historical materials for publishing consideration. All materials submitted are to be previously unpublished in print or online. The guide for this publication is The Chicago Manual of Style. Its use is recommended in writing for The Permian Historical Annual. Articles should be formatted in Times New Roman 12 point with 1.5 line spacing. If possible, articles should be submitted in Microsoft Word or Publisher. All articles should be submitted on standard floppy disk, CD, or in computer file through electronic mail. Do not submit on read-only CD; the editor must manipulate the text and images into the format of the publication. Images, maps, and illustrations are appreciated to make the article interesting. Every first-time contributor to this publication should include with the article a short paragraph, describing his or her education, work experience or community service, and any writing projects. This information will be used at the bottom of the first page of the article. One-sentence paragraphs should be avoided. Numbers should be spelled out when less than 100, but number consistency must be maintained in any one sentence. Example: The class has ninety-nine females and one hundred three males. Writers should refrain from use of a number to begin a sentence. If a number begins a sentence, it must be spelled out. The writing of all dates should be day, month, year—25 September 1944. The use of 9-25-44 or September 25, 1944, are to be avoided. The copy should have one space between sentences. Abbreviations are not to be used, except well known ones. Example: 1500 B. C.
As in all other publications, the editors will edit articles when needed for space limitations, coherence, or ease of understanding. For writers with computers, a copy of the edited article will be sent by email for writer approval. The writer has the responsibility of reading the copy before approval. For those without online service, the editor will print an edited copy and mail it by post office for approval before publishing. Unless the writing is a reminiscence, the writer must document the work by placing a cardinal number [1, 2, 3] at the end of a group of paragraphs that finish making a point. That cardinal number will correspond with a numbered endnote that tells the source of the information used in the paragraph or paragraphs. Endnotes must be placed at the end of the article. The first line should be indented three spaces and a cardinal number [which corresponds with the number in the text], followed by a period, should begin the line. No bibliography should be submitted. Direct quotes must be noted at their close—not the end of the paragraph. For endnote form, see Chapter 15 in The Chicago Manual of Style. Please use shortened form for second and later endnotes. This publication does not use Ibid., 243-46, since it is just as easy to write, Brown, 243-246. If there are questions not answered in this style sheet, contact the editor at jcollett@sbcglobal.net. The use of transitions allow the writing to flow from one point to the next.